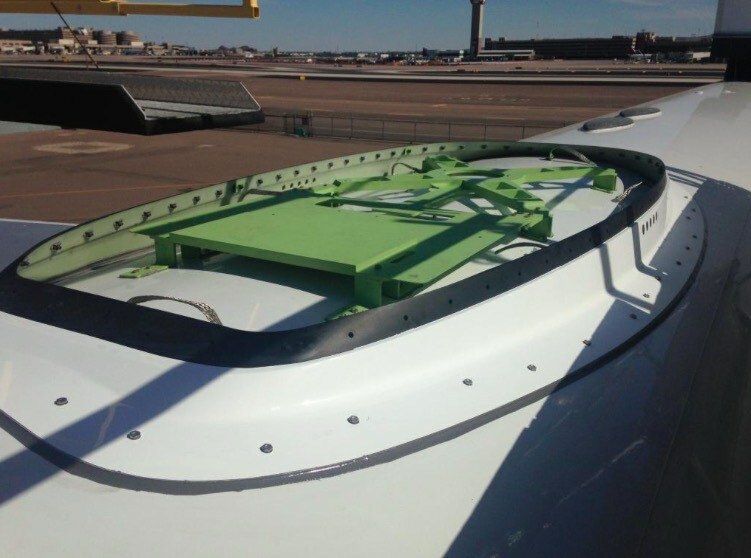 With the successful orbiting of its I-5 F3 satellite on Friday, Inmarsat has the third of three satellites that will enable it to offer truly global Ka-band broadband connectivity to airlines and their passengers. In a livestreamed broadcast via YouTube, the 705,000kg, 58.2m ILS launch assembly lifted off from the Russian-leased Baikonur Cosmodrome in western Kazakhstan, with a Proton-M rocket lofting a Breeze-M upper stage booster and the Inmarsat I-5 F3 satellite to a geosynchronous orbit of 35,786km. I-5 F3 is the third satellite in Inmarsat’s A$2.2 billion Global Xpress Ka-band constellation, which is anticipated to deliver significant operational and passenger connectivity benefits to airlines worldwide. Three satellites make up the initial global coverage, with a fourth also under construction by Boeing to add capacity and redundancy. The first satellite, I-5 F1, launched on December 8 2012 and covers the Indian Ocean region, with I-5 F2 launching on February 1 this year to cover the Americas and the Atlantic Ocean, and I-5 F3 completing the trio over the Pacific. In the interim period, a limited number of regional maritime applications have been using the F1 and F2 coverage on an initial basis. Antennae designed and manufactured by Honeywell Aerospace have been tested using the I-5 F1 satellite using Honeywell’s flying testbed, a Boeing 757-200 (N757HW). Once testing and integration have been performed over the next few months, Inmarsat is expecting to have Global Xpress operational by the end of the year, with many airlines expected to be beating down Inmarsat’s door for truly broadband connectivity. What appears to have been a successful launch will be a relief for both Inmarsat and ILS after a particularly rocky first half of the year for orbital launch systems. In May, the ILS launch platform used today – the inheritor of the Soviet-era Proton rocket launch platform, the Breeze-M upper stage booster, and its Baikonur base – failed eight minutes after liftoff while carrying a Mexican communications satellite, throwing the timeline of the Inmarsat I-5 F3 satellite launch into significant doubt. In June, the failure of the SpaceX CRS-7 mission on board a Falcon 9 rocket, the predecessor to the larger Falcon Heavy launch platform that will be suitable for communications satellites like I-5 F3, also delayed the launch of competitor ViaSat’s next satellite, ViaSat-2. From a commercial aviation point of view, airline customers and their passengers will be breathing a sigh of relief, particularly those who fly frequently over the Pacific. I-5 F3 is the Pacific Ocean part of the Global Xpress constellation network, and its successful launch means that Global Xpress can indeed be global. Those airline customers are known to include Qatar Airways, Vietnam Airlines and Air Caraibes, but there is a significant latent customer base currently operating older inflight connectivity systems. Airlines with only narrowband operational connectivity – including, say, Qantas and Virgin Australia – together with those airlines adopting slower technology like L-band satellite connectivity, will be able to offer fast, global inflight Internet to passengers, and to take advantage of the numerous operational efficiency benefits of a larger pipe for scheduling, crewing, maintenance, repair and other tasks. There is a significant latent (or at least openly latent) customer base for Ka-band connectivity, not least because of the success ViaSat has had with the Ka-band inflight product it brands as Exede, and which primary customer JetBlue branded as FlyFi when it launched. Despite the regional constraints of the initial ViaSat-1 satellite, United Airlines has adopted the same product for its large Boeing 737 domestic and regional fleet. Despite the caveats around comparing bands without also discussing antennae, providers, spot-beams and regional locations, ViaSat’s Ka-band works well, is successful and has made a name for itself within the industry and with passengers. It will remain to be seen whether Inmarsat can do the same with Global Xpress, although the marketing is certainly slick. 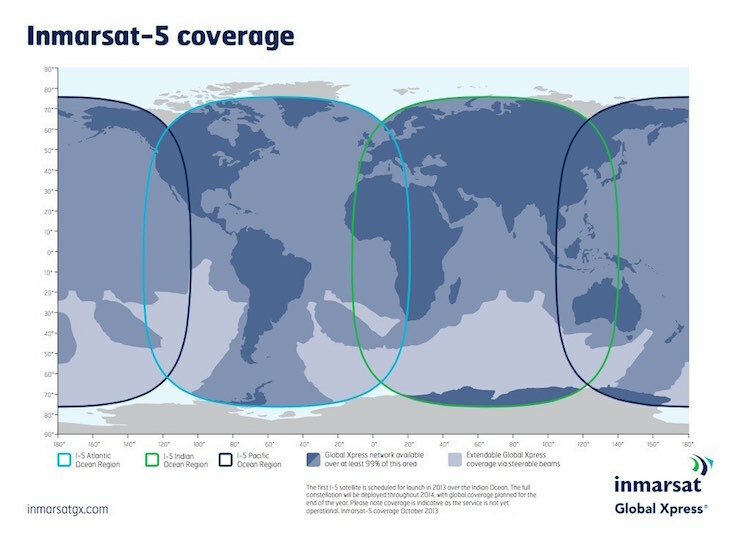 Inmarsat is expecting to use a combination of narrow spot beams and steerable beams on each of the I-5 Global Xpress satellites to ensure that capacity is directed to the areas in which it is required.